We eat a lot of chicken in our house and it’s always nice to switch up some recipes! I was in the mood for something totally different, so I decided to throw together this recipe! Heat oven to 350 degrees. Spread chicken cutlets on a cutting board, make sure they are thin. Place 2 slices of smoked turkey on each piece of chicken. Top each slice with one slice of provolone cheese and 2 basil leaves. 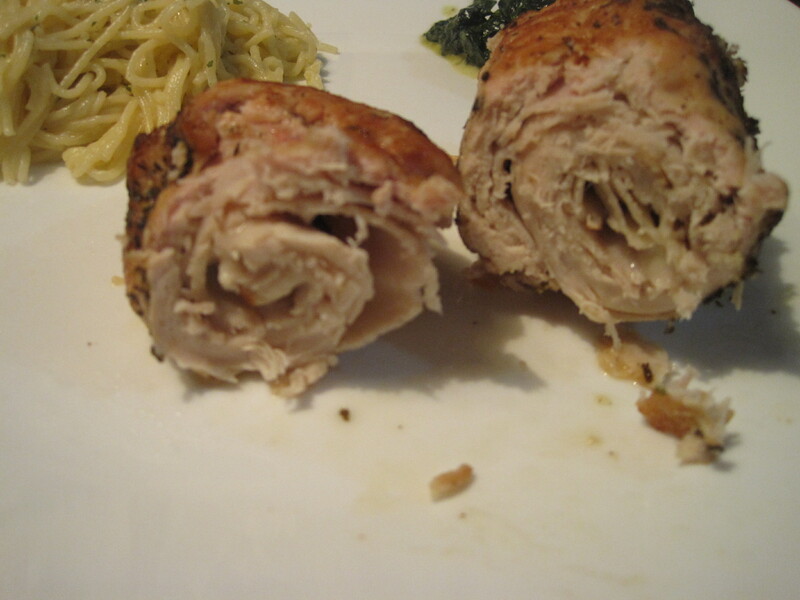 Roll up chicken to enclose filing, folding any overlapping edges of turkey over cheese. Secure closed with toothpicks. Season with salt and pepper. Heat oil in a skillet over medium high heat. Add chicken rolls and brown on all sides, turning about 4 minutes. Place rolls to a baking dish and cover with foil. Bake for 20 to 25 minutes or until chicken is cooked through. Make sure you remove toothpicks before serving! This looks great! I have never made rollantini before but I bet it’s delicious!